Egyptian-themed slots are a dime a dozen in Canada, but there are a few that might just be worth your time to check out. One of these, the Throne of Egypt slot machine from Microgaming, is set on five reels and 25 paylines with tons of fun to be had. The graphics are a bit simple in nature for this giant, but they are detailed and colorful. 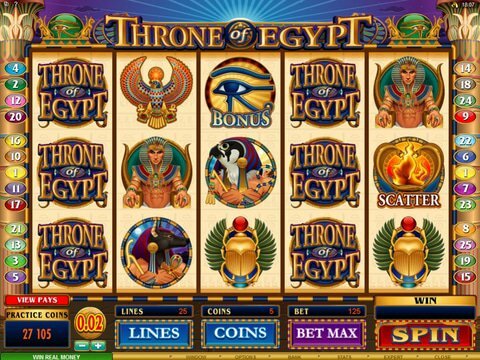 You can review it for yourself right here on this page with the Throne of Egypt free play slot demo that is available here. There's no download and no registration required, and it's available on most computers and mobile devices. One of the best things about this particular game is that it is packed full of features and no one spin is the same as the next. These include the Wild that appears stacked on all five reels and substitutes for all regular icons. The Cobras act as the scatter to provide 15 free spins when they appear on reels one and five simultaneously, and all wins are tripled. Next, there's the Eye of Ra that opens a pick-me style round in which you select from scarab beetles until you find a key. If you find it, you'll go to the next chamber, which is the Eagle Bonus. You'll get three chances to find the key here, and if you do, you'll play the Princess Round. Choose from three Princess icons here to win big! If you want to play for real money while keeping with the Egyptian theme, one of the best games out there is Cleopatra from IGT. Once again, the graphics are far from spectacular, but the $100,000 jackpot certainly is! The Cleopatra wilds double prizes, the Sphinx grants you with as many as 15 free spins triple prizes, and while there isn't a second-screen bonus here, the other features occur so often that you aren't likely to miss it.